Hoi An in central Vietnam is a well-preserved UNESCO heritage site. Venturing outside the town, the landscape quickly takes a turn toward the pastoral. We decided to explore the countryside on the islands around Hoi An on two wheels with Heaven and Earth Bicycle Tours. Over the course of a half day, we rode 9 km through villages, rice paddies, and more. Read on to learn more about our day trip in Central Vietnam outside of Hoi An. We met our group and tour guide who introduced herself as "Yum" at the Heaven and Earth Bicycle Tours office in Hoi An town. After assigning our bikes, making a few adjustments, and testing them out, we were on our way. All Aboard the Bike Ferry! The first leg of the journey was only a couple blocks long. We rode through the streets of Hoi An to the banks of the Thu Bồn River. Our bikes were loaded onto the waiting ferry and we were on our way to the islands! Our first stop was a Vietnamese village known for traditional boat making. We learned that boats like these cost the equivalent of about $3000 USD and are made entirely out of wood. Eyes are painted on the boats to scare away water demons since most Vietnamese can't swim. In the same village where we witnessed traditional boat making, we also got to see an artisan crafting mother-of-pearl inlaid wall hangings, boxes, and more. The process to create the design is quite painstaking and laborious. The end result is a true work of beauty. Cycling on, we passed numerous rice paddies. We learned that Central Vietnam gets two harvests a year compared to one harvest a year up north near Hanoi and 3 harvests a year in the south near Ho Chi Minh City. At our next stop, we learned how basket boats were woven and waterproofed with dung. Apparently, under French colonial rule, there was a tax on boats. The Vietnamese got around this by creating floating 'baskets'. They weren't technically boats so were tax-free but got the job done just as well. Everyone on our Heaven and Earth Bicycle tour got to take a ride in a basket boat with this energetic lady. We took a break as about the halfway point of our bicycle journey for refreshments. We were definitely popular among the local chicks especially when a few crumbs from the delectable muffins we were served hit the floor. Hopping back on our bikes, we rode on but couldn't resist stopping when we encountered a water buffalo and her baby at a watering hole near one of the rice paddies. The baby was simply adorable! The most challenging part of the entire cycling adventure was crossing a floating bridge. The bridge was made from uneven slats and wobbled when people walked or rode on it. We had the option to either ride or walk across. I opted to ride my bike across the floating bridge. I found that the faster I pedaled, the smoother the ride. I was across in no time at all. Peddling on, we stopped again a few minutes later at a farm known for Vietnamese rice wine. We learned all about how the rice is made. Fun fact: the spent rice is fed to pigs and the methane from their farts is used to power the distillation equipment to collect the final product. Fascinating! Rice wine comes in 3 different strengths. Since we were riding bicycles we got just a small taste of the weakest variety. After ride for 9.5 km, we arrived at our final destination, a small restaurant in a tiny village. We enjoyed chicken and rice with hot chilies for lunch. It was a well-deserved meal after an entire morning cycling in the Vietnamese heat. Just next to the restaurant, we learned about one final Vietnamese craft: mat weaving. The lady in the picture above is 93 years old and has been weaving sleeping mats since she was 10. The process takes two people to manage; one person to select the color pattern and the other to do the weaving. They can make two mats per day. Those two mats will sell for $5 ($2 profit). Seeing how this family earns a living was positively humbling and made me truly grateful for the comforts we take for granted. Before we knew it, it was time to load our bicycles back on the ferry for the return journey to Hoi An. The eyes on the boat must have been doing their job since we didn't encounter any water demons en route and the 45 minute ride back to town was completely uneventful albeit extremely picturesque. Our tour with Heaven and Earth Bicycle Tours cost $50 USD per person at the time of writing and included all the necessary equipment and lunch. The tour departed around 8:30 am and returned by 3 pm. 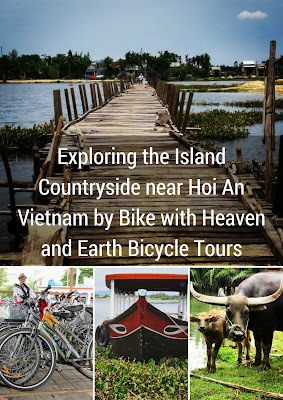 Find out what a Heaven and Earth bicycle tour through the countryside around Hoi An Vietnam is like. A photo-rich post by Jennifer (aka Dr. J) from Sidewalk Safari blog.